Ford Ranger has been an unbeatable 4×4 urban class luxury pickup truck in Tanzania leaving behind Toyota Hilux in the market competition. It is a tough built mid-sized off-road pickup ideally designed for seeking and exploring wildlife safari destinations in Africa. 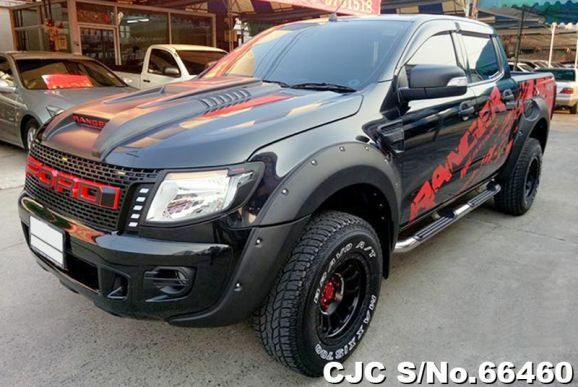 This trendy stylish light-duty pickup truck possesses immense demand and appeal among young age customers in Tanzania passionate enough to import this muscular design pickup with an increased ratio as compared to Toyota Hilux. It is made of front-engine, rear-wheel drive with an optional choice of four-wheel drive layout design structure. It provides a true sense of prestige and solid reputation which leaves a dynamic noticeable impression on customers to make an instant purchase decision. Exterior Design is built with a rugged solid sleek shine robust aerodynamic shape structure well composed of bigger LED Front headlights, front metallic bar grille, front fog lights, front bumper, power side view door mirror, and alloy wheels. On the rear side, it provides a dashing bold catchy glance appeal for customers added with vertically fitted LED taillights, and rear side bumper. The rear side opens flat trunk compartment offers an extended bulk cargo loading storage accommodation with powerful towing capacity. The side doors add a significant appeal with ease of entry and exit for driver and passengers due to firm inside handle grip and low floor cabin design. It is a sporty right-hand fuel-efficient pickup truck available in three different versions of single, double, and smart sized cabin variations. It is fitted with choices of 2.2 L and 3.2 L of turbocharged TDCI 5 cylinder diesel engine powered by manual as well as automatic speed transmission. Ford Ranger is becoming an increasingly popular pickup truck in Tanzania and all over Africa due to its rugged style attitude and all-terrain capabilities to have a smooth seamless driving on all kinds of harsh roads. It is changing the utmost trend of ultra-modern luxury pickup vehicle for people to help maintain a better lifestyle.